An outstanding indoor plant, Ixora chinensis ‘Prince of Orange’ also makes a great garden specimen in the right climate. This is a very reliable variety and used in containers as well as in the garden. Best described as a small evergreen shrub with deep glossy green foliage this is a plant that likes humidity and warmth. Reaching around 2m in height in good conditions when is full bloom the brilliant orange flowers make a stunning display. In Queensland you could try it as a garden plant, excellent in dappled shade as an under story plant. In southern states this is an indoor plant ,or perhaps a sunny enclosed patio. In the garden Ixora chinensis ‘Prince of Orange’ can be pruned every 3 – 4 months. Check to see if buds are forming, if they are wait until flowering is over. The flowering period is long, around 3 months. A moist soil and a complete slow release fertilizer applied every 3 – 4 months will be adequate for most plantings. Mulch around plants to help retain moisture. If need mound up soil before planting to help provide good drainage. 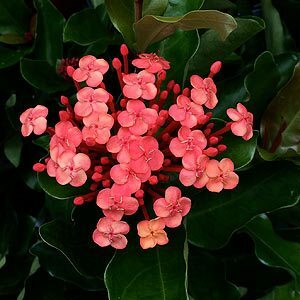 Growing Ixora chinensis ‘Prince of Orange’ indoors and in cooler climates. Growing in cooler climates will require a warm position protected from cold winds and definitely no frosts. Best grown in containers so that as cooler weather comes around Ixora chinensis ‘Prince of Orange’ can be moved to a protected position. Plants need to be kept moist with some humidity for good results. Moisture does not however mean wet, a well drained soil is essential to prevent root problems.